Recently, I was talking to one of my really talented friends about needing to set some goals to wrangle in all the creative thoughts I have floating around aimlessly in my head. For the past nine months, I haven't really been able (or really motivated) to work on whittling down my Ravelry queue or sewing my way through an overflowing fabric stash. As always, there's too much I want to do and not nearly enough time to do it all. Back when I was still pregnant, I dreamed about all the free time I'd have on my hands once I became a stay-at-home-mom, and I naively expected to have more time being home with my baby than I did with an 8-5 job. Obviously, that's not the case, and here I am, feeling overwhelmed about everything I want to accomplish while finding inspiration nearly every day to create even more. So, late last month, I decided that I'd work on setting some creative goals for myself. Starting rather conservatively for the next 6 months at least, I've set a goal to work on and finish one entire project every single month. It's not lofty, but it gives me something to aim for and feel confident about accomplishing. I definitely want to tackle as much knitting/crocheting as I can, but I've also been eyeing a few sewing projects for a while now, so I'll have to dust off the machine, too. For me, this goal-setting is about nurturing a neglected part of my life that really makes me feel complete. I think having a baby really shifts a mama's (and papa's) focus so much from "self" to "baby" that all non-essential time constraints fall by the wayside. For me, that was all the time I spent knitting or crafting or reading a book (yet another thing I'm working on setting time aside for). When we lived in Paris, I would knit or read on my métro commute to and from work, and I met up every week with other knitters to indulge in our craft (and eat cake). Now that I no longer have that prized time on the train to spend working on projects, I have to carve out the time for it elsewhere. I started working on this goal a few weeks ago, and finished a tunic I'd been knitting for Avienne. 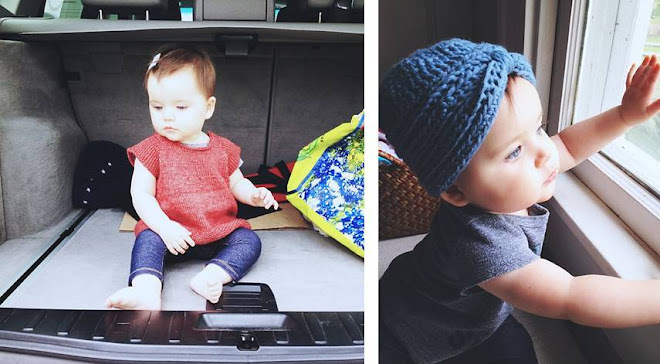 Then, I saw an Instagram friend's baby wearing an adorable knit turban and decided it was the cutest thing ever and then made one for my baby. So, just like that, I've already completed my projects for March and April. Now, I just need to decide on my May project: sewing a dress for me or knitting a dress for Avienne. These are the kinds of decisions I love to make.